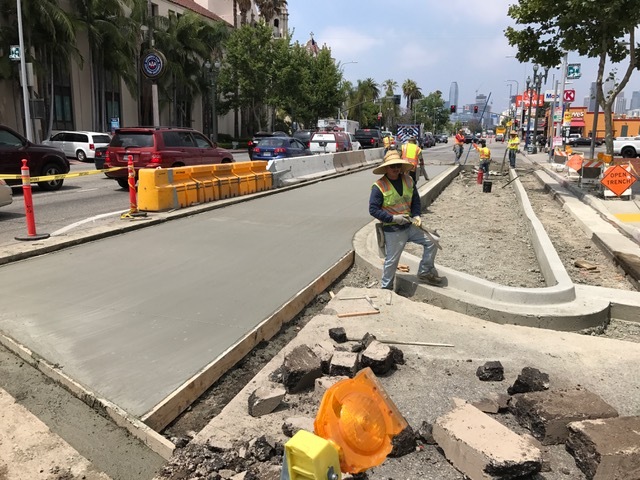 If you've been in the USC area, you have likely seen the progress installing the five bus platforms on Figueroa between Jefferson and Exposition. These are nearly complete, with a few finishing touches and transit shelters expected to be added in August. Now work moves northward on Figueroa, into Downtown. Beginning the weekend of July 29, Figueroa will be reduced to three northbound lanes between 11th and 8th Streets. This traffic pattern will remain in place for the next 60-90 days, while crews pour concrete for four more bus platforms on these blocks. On one or two weekends during this period, the northbound lanes will be further reduced to two lanes—but for as limited a time as possible. You can also be on the lookout for new traffic signal poles going in along Figueroa in the next few weeks! These poles will include new bike signal heads for the protected bike lanes along MyFig, similar to the ones found on Los Angeles Street. Thanks again for your patience while we work to make Figueroa better, safer, and more enjoyable for everyone using the street. During MyFig construction, Fig out a different way to go! Try biking, transit, or an alternate route. See myfigueroa.com for more info. Twitter, and Facebook, and Instagram for further updates too!